I continue to experiment in a range of modes, not necessarily to create a commercial product (which was my original intent), but to continue to use a very hard problem as a way to push myself in new directions for interaction design. This approach also helps me in developing the NETLab Toolkit, where I’ll use the ideas of parallel media streams, and manipulating complex systems in simple ways to try out new features. Next up, using the Kinect. The photos are two of the original prototypes. 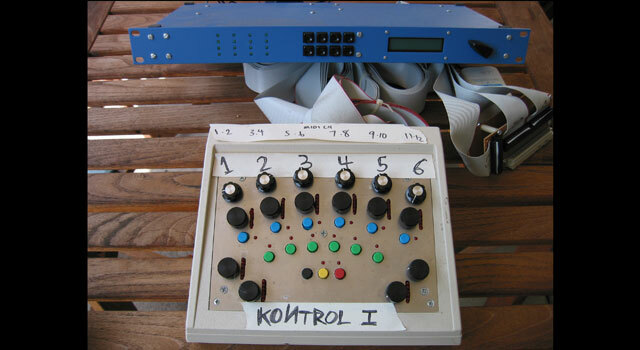 The first one, Kontrol 1, was very much of a learning experience in both design and making. The second one was designed in collaboration with Jonathan Abarbanel, who also composed the music for these demos. Kontrol 2 was the project where I really learned to work with a small milling machine, and improved my making skills greatly. The software for these projects was a custom script in the “Environment” of music sequencing program Logic. The sensors were hooked up to the I-CubeX system by Infusion Systems. This video is a performance I did on March 12th, 2003 for a colloquium in the Graduate Media Design Program at Art Center College of Design, where I teach.